It’s my five year blog anniversary and I am so overwhelmed with emotion and gratitude. First and foremost, I want to thank every single person that has been following me along this journey. Every like, every comment and every email has continued to fuel my passion and make me feel as though I truly have a purpose in this space. Those that have been following me for a while know my story. 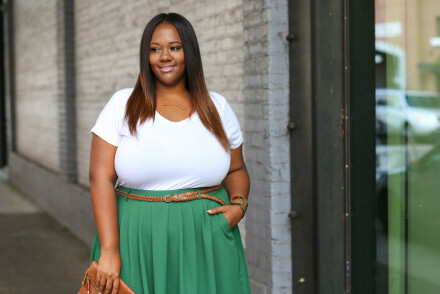 I started TrendyCurvy purely as a hobby with no real expectations of where it would go. 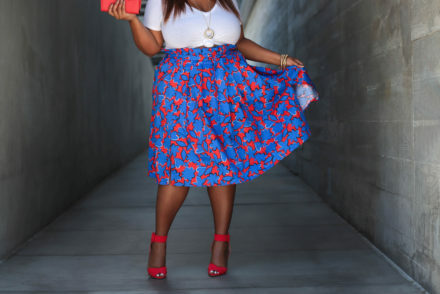 I just knew that I had a unique aesthetic and I wanted to show that plus size women could be just as stylish as anyone else. Now, blogging has become my full time job and I am more fulfilled with my life than ever. None of that would be possible without the love and support of my online family so I cannot thank you enough! Since five years is quite a milestone, I wanted to do something a little different. While my platform is founded on inspiring women, my hope is to also be a voice to move the fashion industry forward. That means talking to brands behind the scenes about more size diversity, expansion of trendy styles and overall plus size representation. While we have had some significant wins, I find myself still dissatisfied with the progression. For instance, I’m wearing this gorgeous designer dress from Marchesa thanks to my friends at 11 Honore. As a plus size woman, that’s a huge deal! Luxury clothing was something that I never thought would come in my size. Yet, as I stand on Rodeo drive, the home of so many luxury storefronts, I cannot walk into one of them and purchase clothing for my body type. In fact, women above a size 14 cannot find many stores in their local malls that carry their sizes. Let’s delve into this a little further. We all know the statistics. An estimated 67% of women in the U.S. wear above a size 14, which is the far majority. Yet clothing options, especially in store, are severely limited. I live in Los Angeles near one of the largest malls in the United States. It has over 200 stores including Nordstrom, Macy’s and JCPenney. Of those stores, about 50 carry women’s clothing. Aside from the department stores, only four have clothing available above a size 14. How do I know that? Well, those four stores are ones that I knew for sure carried my size. Two of them are plus size retailers, Torrid & Lane Bryant, and the others are Forever 21 and now Express carrying up to a size 18. I researched the other women’s clothing stores to see if they had plus sizes online, and then I called the ones that did to see if they had them in store. An additional 15 brands indeed have plus sizes yet none of them are available in store. I think you’re starting to get the picture. I know that nothing happens overnight and I’m not going to pretend that I know the ins and outs of the fashion industry. However, we are in the midst of a plus size/body positive movement. Collectively, we as consumers have made it clear that we want representation. From impactful conferences such as CurvyCon, to the numerous influencers that have spoken out about the issue, we are not letting up. And like I mentioned, we have had some major wins. 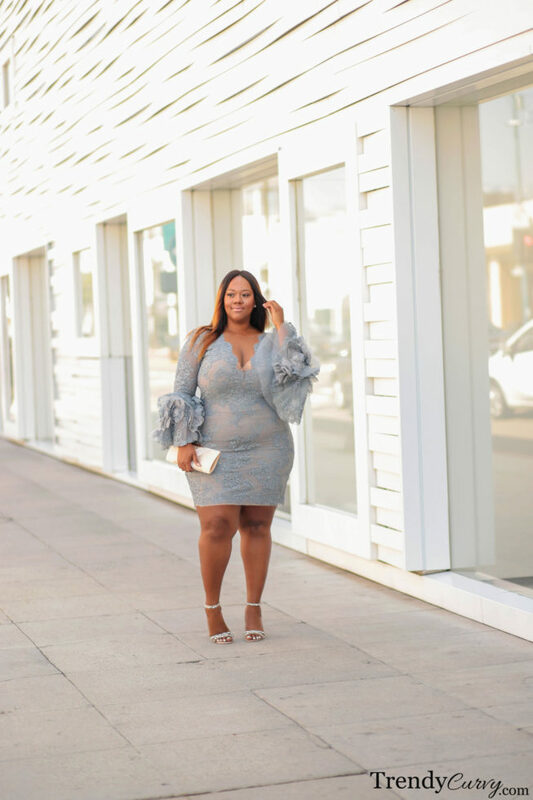 With plus size models walking the runways at New York Fashion Week and Tess Holliday gracing the cover of Cosmopolitan UK, these are moments that should not be taken lightly. Yet in still, the point of all of this is to make fashion more accessible to women of all shapes and sizes. Have brands really done that? Diversity & inclusion is not a box that you can just check off, but it is a commitment to that very principal. So while I am happy about the progress, we have much left to do to bridge the gap. Thank you again for these past five years and looking forward to the road ahead. Also, a big thank you to my love and photographer, Steve Suavemente for capturing me for every single post these past 5 years. Love you! Gosh….your message is very true. 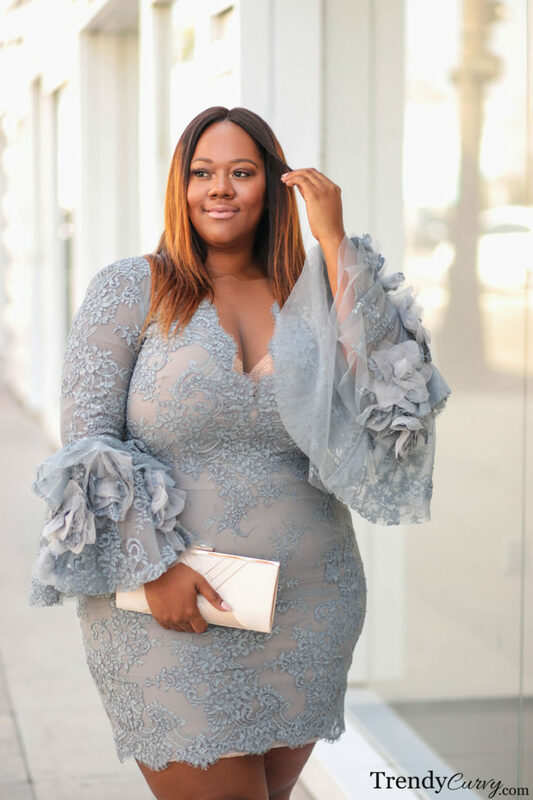 I’m sure that you can relate to my struggle of finding trendy, fashionable plus size clothing in store rather than mostly online. Believe it or not, I’ve been trying to rework my wardrobe from years ago to piece together outfits that work with my current life. Today, I’ve spent hours looking for a full figure sports bra or more importantly plus size active wear. With little choices to select that are long enough to cover my assets I’ve settled for what o could find at Walmart….at least it fits. Congrats on your five years of blogging about the struggle. I will continue to read and comment on your posts. Congratulations, I have always admired your physical beauty ever since I came across your photos on Pinterest. It has since grown to an admiration for your sense of style, your desire to share and help women look and feel better and your graceful humility. Wishing you 5 times 25 more wonderful years doing what you do. You go, girl! Personally I would love to see more stores cater to the “in-between” sizes 8-16. I’m currently size 12-14 and ‘regular’ stores are often too small for me but plus is usually too big. As a result, I’m left out of both. But I really appreciate your blog and efforts to advocate for the community of women of all sizes! Congrats! You are working that dress. Congratulation. It looks like you have done hard struggle for your blog and you updating it. Kristine, thank you so much. I cannot say how much I appreciate everything you have done for me personally. You taught me how to color block, and how to make sure I always have the proper shape wear. God`s word says your gifts will make way for you. You have a wonderful gift and it is opening so many doors for you. I know plus size fashion is not where it needs to be. But it sure is not where it used to be flower mumu and polyester. Lol!! Thank you for representing us with class and style. Thanks to Steve for his awesome craft of photography. Excuse my long winded reply. But I believe in giving credit to excellence. As always you are appreciated. As always your outfit is gorgeous and an on point. And I always love Marchesa and their gorgeous gowns. I think they are one my favorites along with Christian Siriano As for the state of plus size clothing, I totally agree. A lot of progress has been made at an astounding rate, but there is so much more need to be done. Honestly< i work with a lot of overseas brands and they tend to only go to size 22. Both in the U.S. and aboard there needs to be support for sizes over 24 and for bigger plus size women. Congrats, beauty! Where did you get this gorgeous dress?